My name is Jairus. I live in Capernaum, and I love two women. That's all right, however, because one is my wife, Deborah, and the other is my 12-year-old daughter. Though her name is actually Diana, I affectionately call her Princess, and she knows why. She's more precious than a king's daughter to me, and were I a king, I would give the whole of my kingdom in exchange for her life if it became necessary. Actually, I am a ruler, not of a kingdom, but of a synagogue, and there was a time when my position made things very difficult for me. The difficulty mainly involved two people, Princess and a Man named Jesus of Nazareth. Let me tell you more about each of them. Princess brightens our home with her laughter and singing. She has always been a cheerful child. Her frequent smiles, so full of happiness, have a way of spilling over onto whomever she is near, and her zest for living is contagious. That is why for Deborah and me it was as if the sun had ceased to shine when our daughter became deathly sick. But I'm getting ahead of myself. You need to know about Jesus. In my country our economy centers on the Temple and the sacrificial system. Those who are most influential are the priests and religious rulers. They sit on the seat of wealth and power. The people have always followed their leaders religiously--and to a great extent mindlessl--until this young Carpenter from Nazareth came along. He talks about a friendly Father God who accepts sinners with open arms. He teaches that God is more interested in mercy than in sacrifice. He attacks our religious traditions, calls the leaders hypocrites and snakes, and claims that the ground is level when humans stand before God. He says God has no grandchildren, only sons and daughters, and that anyone can be His child. 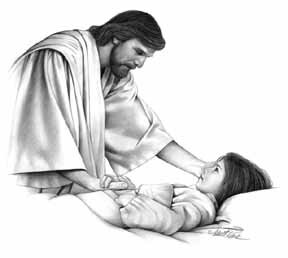 Speaking of children, Jesus talks and plays with them as readily as He talks to adults. He tells stories and uses such simple language that thinking people sometimes feel insulted. 'Scandalous' is the word the leaders use in describing His teachings. Religion is big business in Israel, and quite frankly, Jesus was bad for business. Even my wife and daughter went after Him for a time. Once, they came back from a lakeshore gathering where He spoke and told me how a huge crowd had listened spellbound through lunch and all afternoon to the things He said. Princess enthusiastically told me that Jesus healed the lame, the sick, and even a leper. They told me I should come and see Him for myself. I told them no synagogue ruler would be caught listening to the teachings of a carpenter, and I forbade them, as my family, to ever again go where He was. Then my Princess became ill. One day she was playing, laughing and singing; the next she was bedridden and in terrible pain. Her forehead burned with fever and she complained of severe stomach cramps. Nothing she ate or drank would stay down. In fact, she came to the point of vomiting bile and blood. Oh how I struggled with that request. I loved my daughter, and I would have spent all I had to see her healthy again. I would have secured any physician, bought any medicines, done anything humanly possible for her, but I couldn't ask Him for help. For one thing, He was in opposition to much of what I did and taught as synagogue ruler. For another, I questioned whether He really healed anyway, suspecting rather that His 'miracles' were just hocus-pocus and trickery. And a further thought troubled me. Even if He could do something, He surely wouldn't do it for a doubter and skeptic like me. He wouldn't come to my house. Two more days passed, and her condition worsened. I prayed, pleading with God for her life, but I felt that my prayers got no higher than the ceiling. It seemed God was not there for me! Ruler though I was, my position wouldn't help me now. My neighbor came over and asked if there was something he could do to help. Bitterly and with some sarcasm, I told him he could arrange for the hired mourners, because we had no hope of her recovery. If you've never sat by the bed of a dying loved one, you'll not know how desperately helpless I felt. I held her hand tightly, as if my grasp could keep her from slipping away. Time seemed to race and drag at once. Her breathing began to rattle in her chest, and suddenly my desperation pushed me past my pride. I bolted for the door and began running down the cobblestone street toward the edge of town. Tears blurred my vision, and I stumbled on the rough roadway. I fell to my knees, scraping them and my hands as well, but I was numb to pain. I scrambled back to my feet and continued running recklessly toward the outskirts of Capernaum. My breath came rapidly, my throat burned, my muscles screamed, but I couldn't stop now. I had only one thought and hope. Jesus! Quickly, he bent down and, taking my hands in His, lifted me. 'Let's go,' He said, and we turned ourselves toward home. But the crowd slowed our progress, and I remember thinking, I've come to Him too late. Jesus looked from one face to another. His eyes arrested their laughter. Then He spoke deliberately, calmly and quietly, though His voice seemed to rip through the crowd like thunder. 'You...leave.' He said. Then motioning for three of His disciples to follow, He took my arm, moved me through the open door of my home, and shut it behind us. Like a man in a dream, I led the way to the room where my daughter lay. Deborah was kneeling beside the bed. Her upper body lay across the still chest of our child, and her arms cradled Diana's head against her cheek. She was sobbing uncontrollably, and seeing them there loosed the fountain of my own tears. Regardless of what Jesus called it, my daughter was dead! Then I looked at Jesus and realized that He was the one who was most saddened! His own eyes brimmed over and His face seemed to say that a girl like that shouldn't be dead. It can't be true. She is only sleeping, and I will teach My enemy that he should leave children well enough alone. Gently He helped Deborah to her feet, turning her toward me. I reached for her, and we clung to each other. Then Jesus moved toward the bed, and time stood still. He stood looking down on Diana's ashen face, and then, stooping slightly, He reached out with His right hand and gently stroked her cheek. A silence came over all of us as we watched and wondered. I could feel my heartbeat pulsing in my neck and temples. Deborah's grip on my hand tightened. The room seemed to grow suddenly brighter, and I wondered if my emotions were playing tricks on my senses. As if it were possible! And it was! A tremor passed through her unconscious form. Her lips unclosed in a smile, and her eyes opened widely, as if from sleep. She sat up and gave Jesus a hug, as our hearts overflowed with joy! We now wept tears of another sort and stumbled over each other in our rush to embrace them both. Jesus smiled and moved to one side as our family was reunited. I could tell that He shared our joy, much like a grandparent might beam beside the cradle of their newest grandchild.